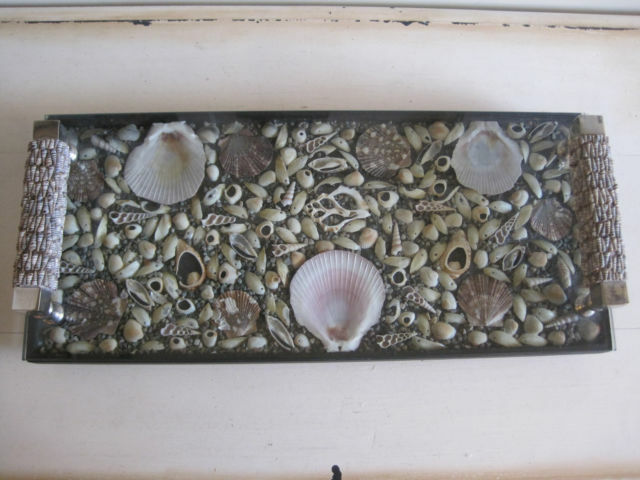 This gorgeous handmade shell tray has a variety of cream and brown shells including pectin’s, white arks, olive shells, and cut shells. There are tiny spiral pointed shells covering the metal handles. The whole tray is grouted together with a piece of glass on top. The base is wooden with metal feet, and metal handles with shells. This is a perfect centerpiece on a mantle, a table, or a bookshelf. The tray measures 17 inches long and 7 1/2 inches wide. Makes a wonderful wedding gift also!